The former barn belongs to the old thatched roof farmhouse - now our guest house with seven lovely furnished rooms and the old horse stable with arches and pillars - now our living room, which offers a unique ambiance for artistic events, courses and seminars. Due to the unique acoustics, it is particularly good for music. The covered outdoor area overgrown with vines, invites you to have breakfast and to have cozy get-togethers during the evening. On cooler evenings, the fire in the open fireplace provides for a comfortable setting. Next to the outdoor area, a small communal kitchen offers you the opportunity for self-catering. In the 4000 m2 garden, walnut and fruit trees offer shade. Those who would like can prepare goulash on an open fire or celebrate a grill party. You have the option of ordering a rich breakfast. We are always gladly available to help our guests at any time with suggestions and good tips. Highlights: We are happy to help with the organization of events and family festivals. Courses from different providers like painting, cooking, yoga or music courses are regularly offered in Dörgicse. The landlord would be happy to make contact with the organizers for you. The bathrooms are cleaned once during the week. 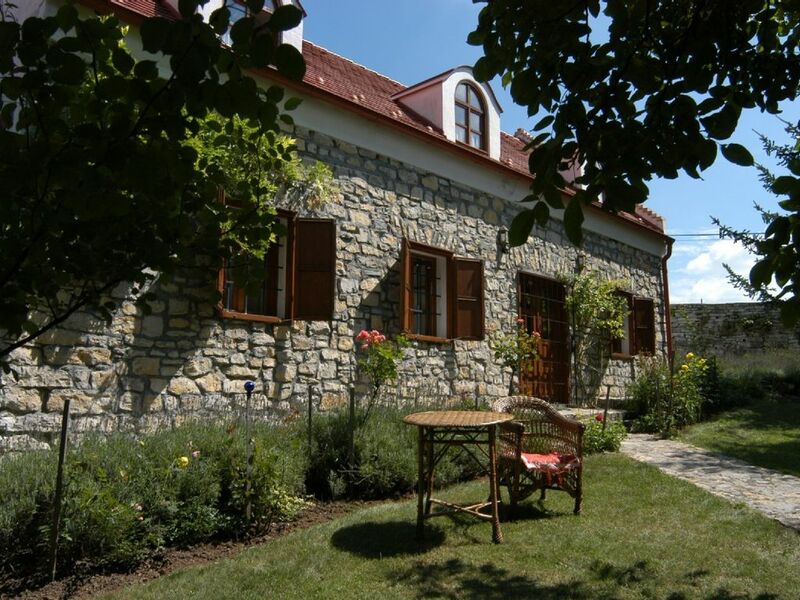 Homemade specialties, 4000 m2 orchard, fire pit in the garden, individual care, wine garden visit, own wine. In the group room: library, piano, CD player. We really enjoyed our 1 week stay at this guest house with family and friends. It is perfect for a group like ours that can take most or all of the house. Nestled in a quiet residential community outside the village center, this rustic house features 6 rooms (a 7th is in the owner's house) in a renovated stone barn, each with its own toilet and shower. The rooms were clean and well maintained and adequate for a week +/- stay. Bedrooms were set out in very cozy country style. The structure consists of 3 separate attached buildings: the bedrooms/baths, the kitchen/dining room, and the lounge, none of which are connected internally (this means you need to go outside to get to the adjacent sections). The dining area has 3 walls and where the fourth would be is open to the courtyard. This posed no problem for us as the weather for us was warm and dry but might be inconvient in the event of cool or rainy weather. The dining area featured the fireplace indicated in the photo and we used it every night! The owners provided us with firewood and candles and this made evenings very charming. The kitchen does not have an oven or microwave but otherwise was complete, and a portable charcoal grill was available. The lounge contains the pictured piano and has seating for a number of people and could serve as a dining room in inclement weather. The owners were very accommodating and helpful, but it helps to speak either German or Hungarian. They live in the thatch-roofed farmhouse across from the courtyard and were available but not intrusive. The grounds were well maintained and attractive. A car is necessary to get to the nearest stores and attractions since the property is located in the hills above Lake Balaton. Local roads led to several hiking trails offering a variety of environments (woods, fields, pine forest, vineyards, etc) and some nice vistas. If you go there, make sure to visit the abbey ruins in Dorgicse proper as well as the castle ruins in nearby Nagyvarsony. A public beach (access fee) on Lake Balaton is about 5 km away in Balatonakali which has restaurants, playground and water activities great for kids. Wir haben mit 14 Personen einen sehr schönen und vor allem erholsamen Urlaub verbracht. Groß, ruhig und sehr stillvoll eingerichtet. Die Familie ist sehr herzlich und zuvorkommend. Wir möchten einen weiteren Urlaub hier verbringen! Wir hatten zusammen mit befreundeten Familien eine herrlich erholsame Woche in diesem schönen Haus. Mit großer Herzlichkeit und selbstgebackenem Kuchen wurden wir begrüßt und genossen die Tage in dem sehr großen wunderschönen Garten. Wir wollen unbedingt wiederkommen! Nur das Beste für unsere Gäste! Das ist unsere Devise. Wir freuen uns sehr auf ein Wiedersehen! Das großzügig angelegte Anwesen mit seinem schönen Garten, wo Walnussbäume Schatten spenden, lädt ein es sich auf einer der zahlreich vorhandenen Relaxliegen bequem zu machen. Rosen und Lavendel duften rund ums Haus. Die Zimmer sind sehr liebevoll und mit Geschmack eingerichtet (ein jedes anders). Sowohl der Freisitz als auch der Wohn-/Aufenthaltsraum geben den richtigen Rahmen für gemeinsames Essen oder Seminare. An kühlen Abenden wird der gemütliche Kachelofen angeheizt und man kann ein (deutsches) Buch aus der umfangreichen Bibliothek lesen. Auch wunderschöne Bildbände sind dort zu finden. Ein Auto ist allerdings erforderlich, will man die Gegend um den Balaton erkunden. Die Gastgeber sind sehr herzlich und immer auf des Gastes Wohl bedacht. Ich kann diese Unterkunft sehr empfehlen. Wir haben knapp zwei Wochen in diesem Landhaus verbracht und es war trotz des eher regnerischen Sommers ein gelungener Urlaub. Die gesamte Anlage ist äußerst gepflegt, alles sehr liebevoll eingerichtet und wir wurden sogar mit Kuchen und Gebäck verwöhnt. Danke nochmals! Wir haben uns alle (Kinder, Eltern, Großeleltern, Hund) wohlgefühlt und werden sicher wieder kommen! Ein absoluter Geheimtipp und zu 100% weiterzuempfehlen! Only 6 km from Plattensee in the heart of the national park you will find the picturesque village of Dörgicse, surrounded by vineyards, meadows and forests. This has been a well-known wine region since the Roman times. It has three medieval church ruins. Only 10 km away is the peninsula Tihany, the former fishing village with traditional, thatched roof houses, a lot of cozy inns with gypsy music. You can go on a day excursion to Budapest or in an hour you can be in the famous thermal lake in Heviz. It also offers diverse recreation options: beaches, the Balaton bike path or also the stunningly located 'Royal Balaton Golf Club' (6 km). In the surrounding inns you can eat good Hungarian food and the enjoy the tasty wines of the region. Wine tasting in the private wine gardens are also popular. Golf: Only 10 minutes (6 km) from our cottage golf lovers will find the newly opened 'Royal Balaton Golf Club', a stunning course above the lake. Auf vorherigen Wunsch bieten wir gerne ein reichhaltiges Frühstück für € 8,00.-. Wir vermieten unser Haus ab mindestens10 Personen. Zusätzlich muß eine Kurtaxe von € 1.00 pro Tag/Erwachsene bezahlt werden. Zusätzlich ist eine Kurtaxe von € 1- pro Pers./Nacht zu zahlen. Additionally, there is a visitor's tax of € 1.00 per day for all adults.